Assistant Director Shaun Spalding and New Media Rights Fellow Erika Lee will discuss the basics of intellectual property at the KPBS Explore Local Content Project Orientation on Wednesday December 13 at 6pm! Ever wonder what sorts of issues you may encounter as a creator or entrepreneur, and when you might want to reach out to a real life lawyer? 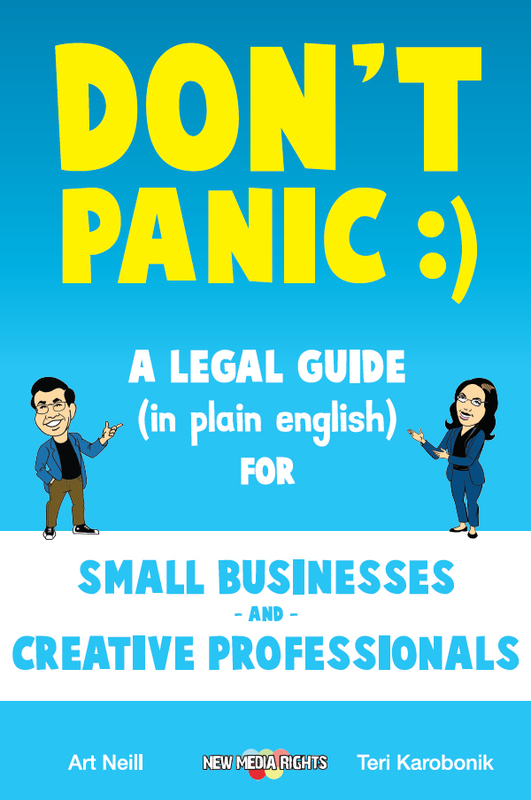 That’s what our book "Don't Panic: A Legal Guide (in plain english) for Small Businesses and Creative Professionals" is all about. This book is designed to help you through the legal issues you may run into as a creator, entrepreneur, or innovator. We focus on issues you may encounter from the inception of your business to the moment (that hopefully doesn’t happen) you get a nasty lawyer letter for the first time. While this book is not a substitute for legal advice, it can serve as a helpful guide to preventing and resolving legal issues. How does copyright protect your work, how does it protect the work of others? When do you need permission, and when can you reuse a photo, video, or audio clip without permission? We’ll answer these questions and also leave plenty of time for Q&A. We'll be answering these questions and more in a workshop at UCSD Extension with the San Diego Final Cut Pro User Group June 6 at 7pm. See you at SXSW 2016! Thanks to your votes, New Media Rights is heading to SXSW interactive in Austin, Texas. On Tuesday March 17th at 2:00PM in room 5ABC of the Austin Convention Center we’ll be presenting our panel “Can We Just Play? The Legality of Let's Play Video”. Let's play videos are more popular than ever, however, for many creators what's legally okay and what isn't is more unclear than ever. Come learn the basics of copyright and trademark law that you need to know to keep your videos and streams up. Also get a chance to hear from legal experts and video creators about hot topics like Easter Egg Videos, Esports and using in-game music. Joining Art and Teri will be Wikimedia Legal Counsel and lifelong gamer Jacob Rogers, as well as Angelo Alcid attorney and writer of the Journal of Geek Law. So if you'll be at SXSW come check it out! Don't have a badge? No worries! SXSW gaming is open to the public so if you happen to be in Austin and are willing to brave the SXSW crowds come on by! If you can’t make it, you can follow our panel on twitter using #NMR. Read more about See you at SXSW 2016! How do I find the copyright holder? Whether or not you need to get permission to use the work. How to get permission if the creator is still alive. How to get permission of the author is dead. Orphan works and what happens when you can’t find the author. Read more about How do I find the copyright holder? NMR launches law school IP and entrepreneurship clinics list! As we've written about before there's a major justice gap when it comes to creators and entrepreneurs having access to critical legal services. While we do our best to provide free and low cost legal services, we’re only one organization. That's why we’ve created a national list of law school legal clinics as a resource to creators, entrepreneurs and even other lawyers to help find other legal clinics fighting to fill the justice gap. The clinics on the list typically provide completely free or low cost services depending on if you qualify and they have the capacity to take on new issues. Check out the complete list here. Read more about NMR launches law school IP and entrepreneurship clinics list! September Newsletter:NMR students are front page news! NMR students are front page news! You may have heard about our fair use app…we hear its kind of a thing now. This summer California Western School of Law did a featured front page story all about our app and our amazing student interns who helped us create it. You can check it out over on the CWSL site here. Are you a student at California Western School of Law passionate about helping artists, entrepreneurs and internet users with legal issues brought about by the digital age? This spring we will once again be offering an opportunity to be a part of our clinic class, check out our intern page for more details on how to apply. Applications open September 9th and close October 9th. Read more about September Newsletter:NMR students are front page news! 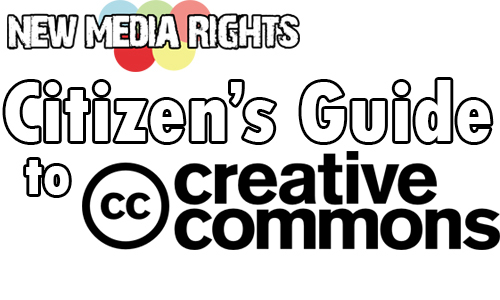 On this page of the Citizen's Guide to Creative Commons, we'll go over the most basic features shared by all Creative Commons licenses, and cover the responsibilities and privileges given to those using CC licensed work!. Let's choose a Creative Commons license! Here, we'll cover the different licenses you can choose, the various requirements you can set with your license, and we'll show you how to put your work in the public domain.